We decided to hire a car for four days to explore the Grampians National Park (after a recommendation by a lovely girl called Lina who we met in a hostel in Perth), the Great Ocean Road and the Otway National Park before driving to Melbourne where we would be spending the next month or so until 27th December 2016. Our first stop on our journey to Port Fairy was Mount Gambier which is at the bottom of a dormant volcano and is famous for the Blue Lake. This lake is a brilliantly bright turquoise colour in the summer and for a few days in November (the rest of the time it’s a dark bluey-grey). Luckily, we were there on one of those November days and got to see the lake in all its glory. Apparently the turquoise colour comes from calcite crystals suspended in the water which form at a faster rate during the warmer months (or so my Lonely Planet book tells me!) It was really pretty and was a good little stop off during our long journey across into the next state to Port Fairy. The sun was just starting to set when we arrived at Port Fairy so we made the most of the remaining light and explored this little town. Battery Hill is one of the main things to see and was a point of defence in case of invaders in the 1900s. As it is a hill, the views of the coastline were lovely (especially with the sun setting) and there are still cannons there dotted along the hill defence line. We had heard that there were black wallabies in the area and our map of Port Fairy told us the best place to see them was Griffith Island. We were at the best time of day as they start coming out at dusk and so we headed over to the island in the hope of seeing some. Unfortunately the Island wasn’t open to the public for some reason but we did see a silhouette of one from the mainland. Instead we drove to the seafront and watched the sunset. The next morning we went back to Griffith island to try our luck again at seeing wallabies but we didn’t see any so headed out of Port Fairy to visit Tower Hill. We were recommended to go to by the owner of the hostel as a good place to see kangaroos and koalas (we will always go if we have a chance to see cool animals in the wild!). Tower Hill is a volcanic formation believe to have erupted about 300,000 years ago. There are lots of overgrown areas, forests and walks to do (like a national park in the UK). The main difference was that we saw an emu in the bushes and 3 koalas high in the trees (the are so so cute!). We picked one of the walks as we didn’t have all day to spend here and headed up the volcano to see the big crater that remains. 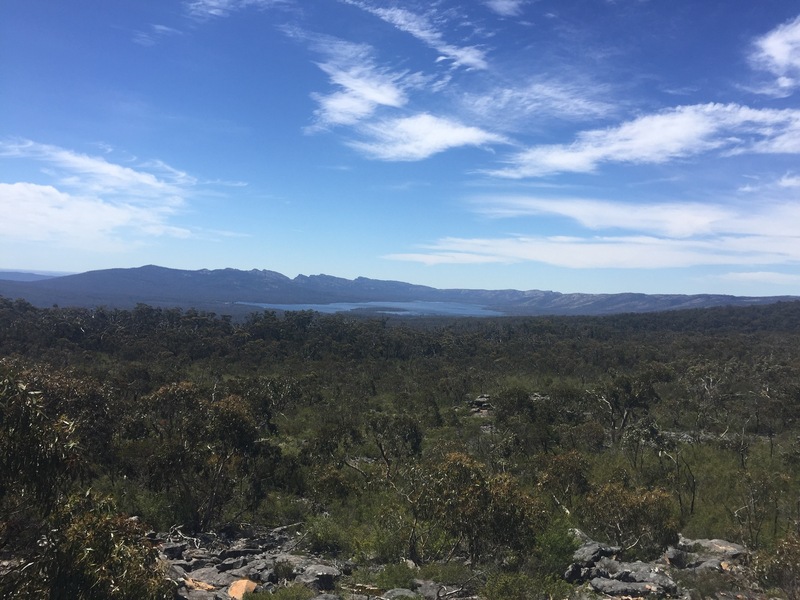 There is a lake in the crater (not to the scale of Blue Lake at Mount Gambier) and the walk led us around half of the crater and back down the mountain. We didn’t think we would see any kangaroos but Niall is very good at spotting wild animals and we ended up seeing 2 relaxing in the shade at the top of the crater. After we looked for more koalas in the trees by where we had parked, we headed to the Grampians National Park which is a huge mountain range north of Port Fairy. We had to drive a very long way through tree lined roads with a backdrop of vast mountains before we reached some form of civilisation. Our first stop was Lake Bellfield which was a huge dam. We didn’t realise it was a dam at first and we’re quite confused by the trees sticking up out of the water. The lake is so huge that you can’t see the dam from one end of the lake. There were a lot of cockatoos and parrots around the lake and a few people had stopped here for their lunch. On our way to the next site, we saw emus and kangaroos on the side of the road – I don’t think we’ll ever get used to seeing kangaroos in the wild! Mackenzie Falls was our next stop and was around an hours walk down to the summit. Along the way there were different vantage points to see the falls but the best view was definitely from the bottom. The spray was immense and very refreshing as it had gotten quite hot walking down to the summit. It was amazing to be able to sit and watch the vast amount of water crashing down. Whilst driving through the Grampians we passed an Echidna on the road, we had to get out to get it off the road because it just kept curling up in a ball. The next stop on our whistle stop tour of the Grampians (people can spend weeks here doing different walks) we went to the Reed Lookout and Balconies. The man in the info place who told us about the Balconies told us it used to be called the Jaws of Death (he said it was in a time when people called things cool stuff ha!) There were really nice views from the top and a great walk through the mountain range. It was amazing to see how vast the Grampians National Park actually is. The Balconies itself are two rocks one of top of the other hanging out over the cliff – I think we expected it to be a big more really but the views were truly spectacular. Next was the Boroka lookout which also showed more phenomenal views of the other side of the National Park. All of the lookouts involved really nice walks through the National Park and the weather luckily stayed great which made it all the better. Another site on our quick tour of the Grampians was the Grand Canyon. This was my favourite place that we visited – it was truly spectacular. This place is really cool so you should definitely go see it if you ever go to the Grampians National Park. The best way to describe this place was a huge canyon of layered rock with a stream running through it. The canyon had a long walk through the valley on stepping stones and over rocks and showed great views. The Silverband Waterfall was another site we saw before we left the Grampians to our next site. This was a much smaller fall to Mackenzie Falls but had a lovely walk through the forest to it so it made it worth it. The wall of the falls was jagged and layered which meant the water would fly off at some points and showed how powerful the small fall was. On our way to the next hostel we saw a koala that was about to cross the road. A lady with dog stopped it crossing because of all the cars (our car being one of them) – I get super excited every time I see a koala so we had to stop and try it. It had started going up a tree but we still saw it really close! We finally arrived in Warrnambool where we would be spending the night before heading out onto the Great Ocean Road.